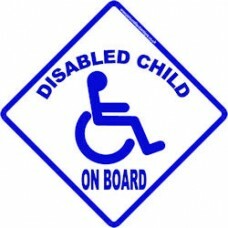 Disabled on board car signs. 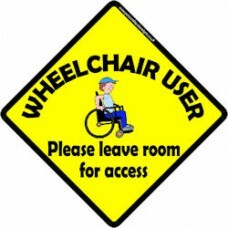 Helpful to make other drivers aware. 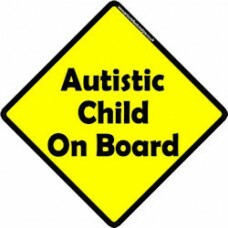 A simple sign to make other drivers aware of who is on board. We've had some really positive feedbac..
Disabled child on board car sign. 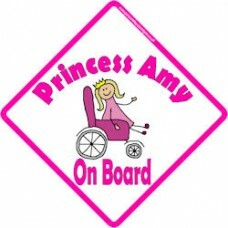 A great way to make other drivers aware and to leave extra room ar..
A pink version of our disabled child on board car sign, a great way to inform other road users and h..
A disabled car sign with a more modern twist, showing a boy in his wheelchair asking people to leave..
A princess on board car sign, with a wheelchair, this sign politely asks people to leave room..
We offer a range of disabled child on board car signs to help make other drivers aware to help keep their distance. We are continually trying to expand our product range, and should you have any suggestions on how we can add to our disabled baby on board range, please get in touch.